Moving house and now a spring clean caused me to stumble across some more data from my Tenerife trip last July 18. This is a section of the Milky Way focusing in on Vulpecula. Whilst I originally tried to centre on an emission nebula and reflection nebula including NGC 6820 (which appears at the top of the image) I managed to capture a huge amount of Lynds Dark Nebula, in particular the 'fishhook' which can be clearly sean in the middle of this image. 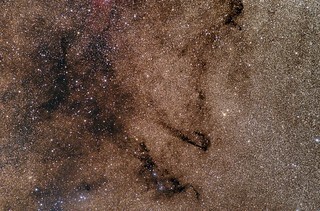 After scouting about through software and books in my library, I finally found this patch of the sky mentioned in much detail in my newly acquired 'The Night Sky Observers Guide Volume 4 - The Glories of the Milky Way to -54 degrees' which is an excellent book I obtained from The Webb Deep Sky Society.